Once in a while, you've gotta make an exception. 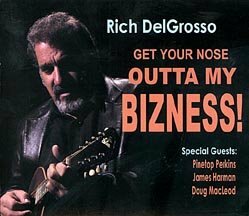 So here I am, reviewing Rich DelGrosso's CD, even though it's not electric. At least, not electric in a strictly literal sense. There's enough energy and vitality in this recording to power a small city. So why bother plugging in the mandolin? Rich plays through a pickup when he needs to, but in the studio you don't need to. Electric guitar and bass show up on a couple of tracks, but by and large this is an acoustic CD. A W.C. Handy award winner, Rich is well known as a top-flight blues guitarist and educator. But he's also spent years soaking up mandolin know-how from the earlier generation of blues mando masters. Rich was able to study with Howard Armstrong and Yank Rachell before they died — and via recordings, he's absorbed ideas from other greats, such as Johnny Young, Carl Martin, and Charlie McCoy. He even has a blues mandolin method book forthcoming from Hal Leonard later in 2006. Rich's primary instrument on this disc is a teens Gibson A-model with the classic, warm oval-hole tone you'd want for a recording like this one. (It also happens to have remarkable volume and projection — I've heard him play it live.) On two of the tracks, however, he's playing one of the new wood-body resophonic mandolins introduced by National in 2005 — which, by the way, easily eclipse vintage Nationals for tone and playability. If any doubt remains as to whether the mandolin is a viable blues instrument, Rich lays it to rest with Get Your Nose Outta My Bizness. On most of the cuts where he plays mandolin, Rich doesn't even bother with a guitar track. 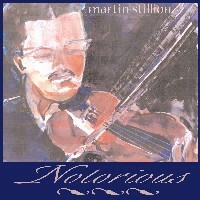 A superb rhythm player, he carries the groove on the mandolin, often backed just by bass and drums. Born in the Midwest, Rich seems most comfortable with Chicago-style blues, but let's be careful not to generalize: this recording encompasses all the various "neighborhood" grooves (Southside, Eastside, etc.) that originate in ChiTown. When it's time to solo, Rich does so with authority and panache. His mandolin leads are full of strong melodic ideas, meticulous phrasing, tricky crosspicking, and just the right amount of tremolo for color. If you don't think it's possible to bend notes on a mandolin, Rich will be happy to prove you wrong — and make it sound easy. He's the first blues mandolinist I've heard who's completely mastered this difficult art. And I'd be remiss if I didn't mention his fine guitar playing or the tasteful work of the supporting cast, notably Pinetop Perkins on piano. That said, let's not forget that it's mostly a vocal CD, and Rich's vocals are gravy. He has an expressive, gravelly baritone, terrific timing, and abundant humor. Whereas the songs are mostly covers, Rich has gone a bit off the beaten track to collect them — so it's not likely that you've heard most of them before. Lyrics are standard blues fare: hard luck and unfaithful women, but the warmth and wit of Rich's voice succeed in selling the material. By any standard, this is a fine work from an artist who deserves a wider audience — and if you happen to be interested in what's possible on a mandolin, you've gotta have this. Buy it directly from Rich. In a previous review I suggested that Billy Flynn's recent CD set a 21st-century milestone for blues mandolin. And it does, but Rich has already eclipsed it. Emando content: None, but don't let that stop ya.